I’ll admit, this post should’ve been up weeks ago. 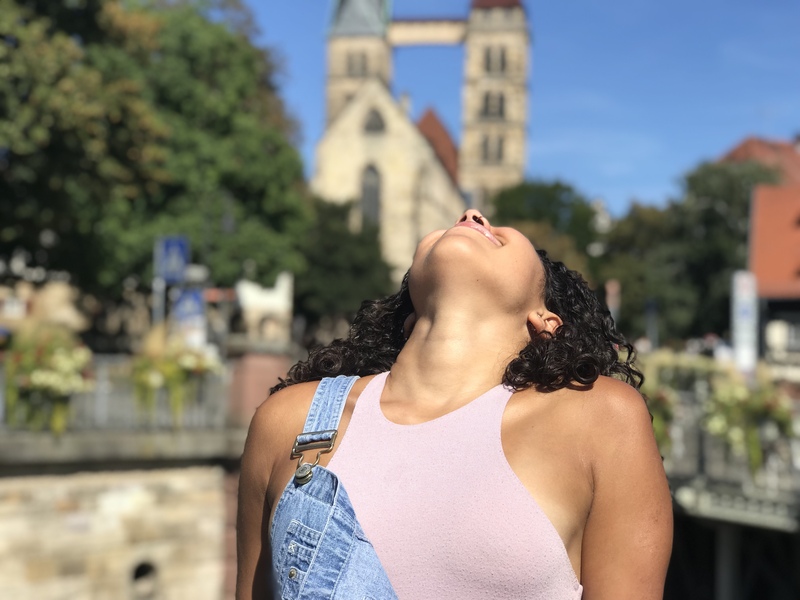 I am a master procrastinator, and I’ve been thinking of the right words to sum up my summer in Germany. Challenging, rejuvenating, familiar, happy. My German language skills are below average despite growing up with two German speaking parents and 4 years of the class in high school, so I challenged myself and took an intensive B1 course at the local school. That meant waking up early, hopping on a bus, and spending 3 hours learning in a class with adults from all over the world, entirely in German. The course was different from anything I’ve ever done before, and at times it was incredibly boring, but I know that I learned a lot. The biggest growth is my language skills definitely just came from my increased comfortability to use them. I usually rely on my parents to help me communicate in Germany, but with them gone, it was all on me. I became a translator for my sister, and really tried to speak for myself too. Normally I’m pretty nervous to try out a new language for fear of getting it wrong, but surrounded by family, it was quite easy to push myself. Since we’ve been going to Esslingen yearly since I was born, there was no incredible urge to explore the city, although I loved every minute of waking around in a place that feels like home. Nearly every day we would go to get ice cream at the tower, check out the bookstore (more on that in a bit), and just sit in a cafe with a piece of cake and an espresso. Writing this from India right now, I can tell you I miss that daily espresso!! We also did some old favorites like hiking up to the burg and through the vineyards, and visiting Merkels Schwimmbad for a dip in the pool and some time in the sauna. One day we went to Stuttgart with my Omi and went on not one, but two bus tours that took us through the hills around Stuttgart. We were also in Esslingen for the best time of the year, which would of course be Zwiebelfest! A 10 day event celebrating food, I got to eat some real German classics, like Käsespatzle (cheesy noodles), Maultaschen (raviolis), and Flammkuchen (flat bread). It was a delicious time! So between trips to the city and school, I spent the majority of my time reading. I would go to the bookstore nearly everyday, find a cool book, buy it, and read it all in the same sitting. I finally discovered the library, where the cycle continued. I loved having all the time to read and enjoy my books, and I think I was able to finish about 15 books in that month! Some of my favorites were The Keeper of Lost Things (Ruth Hogan), My Absolute Darling (Gabriel Tallent), Everything I Never Told You and Little Fires Everywhere (Celeste Ng), and Stay With Me (Ayobami Adebayo). I highly recommend all of these if you like some good fiction! A highlight of our time was a weekend trip to visit our brother who recently moved to Regensburg. We took a train to Nürnberg where we met my aunt, who took us on a little sightseeing walk around the city, then we picked my brother up. The weekend was spent at his new cozy apartment, and I had a good time getting to know his city. There’s some beautiful churches, like St. Peter’s Cathedral and St. Emmeram, where I accidentally took a photo of a dead body (I didn’t think it was real!). There are also some splendid bridges (my favorite!) with great views of the city, and some cool restaurants. It was amazing to catch up with my siblings, and finally get to do some adult things together (we’re adult siblings now, how crazy!). I won’t see him for probably a year, so I know I’ll always cherish that time with him. Another highlight was all the family time. Just sitting outside for dinner or on the deck sipping espresso, it was always a joyful time with my family. Going out for dinners, talking about the future, and just catching up are always some of the best parts of visiting Germany. I love my extended family and it’s tough not getting to see them often, so this trip really brought us together. I can’t wait to go back and do it all over again! Next Namaste! I’m in India!